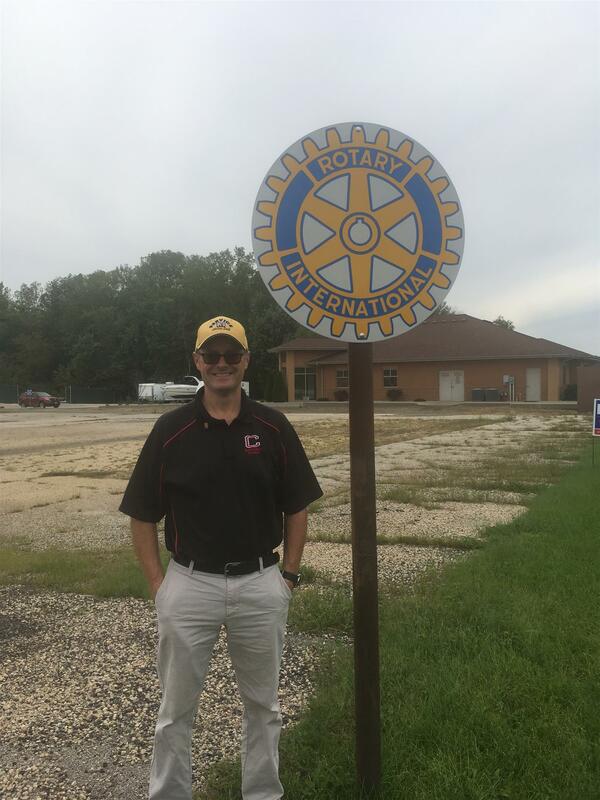 The Story of our Rotary Sign in La Crescent. When District Governor Bill Hoel came and visited our club in August, he shared the Rotary goal of sharing our story, and increasing our visibility in our community. President Darren Winkers took it to heart and looked for opportunity. He noticed many communities had signs announcing Rotary's presence in the community. He asked the question, why don't we have that? To dig into that, conversations were had with many long standing members of our club. "We used to have them", was a common message. Secretary Eileen Krenz uncovered that we still had the signs in storage, but that the City Council and State Highway department had made it clear years ago that it wouldn't be allowed. "For some time," Krenz explained, "We would go out and put up the signs near the entrance to the city on the highway. Some time later, Highway Department Staff would remove the signs and return them". After further research, we discovered that many of placement locations required the approval of 4 agencies and their rules: City Council, MN State Highway Department, Minnesota Scenic Byways Commission, Federal Highway Administration. La Crescent is a unique community to be home to 3 Scenic Byways. That also brings its challenges, as Scenic Byways have strict sign regulations. President Winkers would not take no for an answer, and looked for more options. One area he found a clear exception on with all rules for those agencies was that private property was exempt. After reaching out to some property owners and friends of Rotary, our community now again has 2 Rotary signs visible to our community. One on the Wieser Brother's property along the Pike to La Crosse, and one on the Amlaw-Swift family property on Elm Street near the heart of town. While these may not be permanent homes for the signs, it gets them back into our community so we can share our Rotary Pride. This couldn't have been done without the fortitude of President Winkers by continuing to reach for the goal and sharing Rotary with the world.